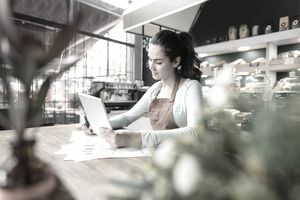 Whether your small business is a one-person, home-based business or a larger SMB with multiple divisions, as part of your accounting setup, you'll need to have a petty cash fund to cover small expenses or employee reimbursements, typically under $25. If you have a petty cash account and keep track of your transactions out of that account, it becomes easier for you to track tax-deductible expenses, journal entries you should make, and separate personal expenses from business expenses. Petty cash is a small amount of cash kept on hand to cover expenses that are too small to bother writing a check. You might use money from the petty cash fund to pay for minor expenses such as postage, cab fares or office supplies, or reimburse someone $9 for bringing in a box of donuts. A petty cash voucher or receipt is typically filled out with information on each transaction so that it can be entered into the company's accounting system and included in the company's financial statement information. Here are five easy steps and two tips you should take to set up a petty cash account for your small business. If you have a larger SMB, you may want to set up petty cash accounts for each of your divisions. Add a Petty Cash Account to your Chart of Accounts if you do not already have one. Start a petty cash fund by writing a check drawn on your company to "Petty Cash." Cash the check. If you have a one-person, home-based business, you may only need $100 in your petty cash fund. If you have a larger SMB with multiple divisions, you may need a petty cash fund for each division and it may need to be a bit larger. Base the size of your petty cash fund on the size of your business and your judgment as a manager. Place the petty cash, from the check you cashed, in a designated petty cash drawer, which can be locked, or a locked petty cash box, or a safe. The drawer, box, or safe in which you place your petty cash should have a designated location within your office from which it should not be moved. With regard to the petty cash fund, the fewer persons with access to it, the better. You should give two people access to the petty cash fund. If you have multiple petty cash funds in multiple divisions, give two people access in each division. One person should have the responsibility for replenishing the petty cash fund. The second person should have responsibility for recording the petty cash transactions into your bookkeeping system. This custodian should make an entry in the cash disbursements journal. If your petty cash fund is set up in the amount of $100, then debit Petty Cash for $100 and credit Cash for $100. Make a list of expenditures from the petty cash account as you make them. Attached to that list should be receipts for each expenditure. These receipts are your source documents to back up your journal transactions. Debit each expenditure and credit cash in the cash disbursements journal. Replenish the petty cash fund back to the approved amount as needed. Be sure and make your journal transactions from the source documents first. Replenish the petty cash fund when you cannot get through the day with the petty cash you have on hand. Some companies keep only $50 in the fund, while others keep up to $200. Choose the amount based on the amount of expenditures you need to cover each month out of petty cash. Set a dollar limit on purchases that can be made from petty cash, such as $25 or $50 maximum.